Hakuin Ekaku(1686-1768) was one of the most influential figures in Japanese Zen Buddhism. 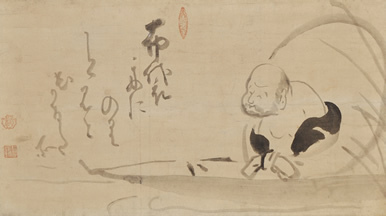 An important part of Hakuin’s practice of Zen was his painting and calligraphy. Zenga, or Zenga paintings means the paintings and calligraphy created by Zen priests to express their inner world, and Hakuin was both the great founder of Zenga painting and its greatest proponent. His subject matter ranged from fierce visage ancestor priest portraits painted for his disciples or various regional temples to small, immensely humorous works painted in response to requests from members of his local parish. His paintings are usually meant to capture Zen values, serving as sorts of "visual sermons" that were extremely popular among the laypeople of that time , many of whom were illiterate. This is the reason why that is referred to as the founder of Rinzai revival. Jakuchu is a painter who lived at the period when mainstream of Japanese painting transited from "Kanou school" to "Maruyama school". First, he learned the "Kanou school" ,but was not satisfied with the Funpon(a special draft method) principle of "Kanou school". After studying the brushwork of the "Song and Yuan", finally he was establish a style of his own. Features of his paintings is Representation of realism that may be different from"Maruyama school", It is a drawing by bold composition. In particular, the"line of contact write" representation of light and shade of ink, without drawing the outline is a technique o his own. Soga Shohaku (1730-1781) is a painter who lived at the period when mainstream of Japanese paintings transited to “Maruyama school” which is typical Japanese realism. He wins fame in technique of the wide knowledge that he learned from "Unkoku schooll"(inherits the style of painting of”Sesshu”), "Soga group"(excelled in Picture of hawk), and Kyoto branch of “Kano school”. In his work, attentive expression coexists with bold expression. Furthermore, he used ink to express light and shade skillfully of his work. He proceeded to another way with “Maruyama school” who had much superficial expression. He can cope with all demand. Because, When he is drawing of the China historical Myth, a motif is expressed ugly and jocularly. On the other hand, when drawing a flowers and birds figure and animal painting, expression delicate and gentle to that the feeling of an animal was transmitted to us. You can search artists' works. When you start typing, candidates are displayed.